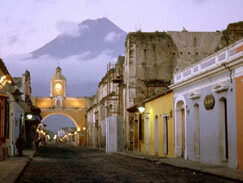 La Antigua (UNESCO World Heritage) is a beautiful and charming city in the high plains of Guatemala. It is best known for its well preserved colonial architecture, its wonderful restaurants and its exciting nightlife with bars, live-music and discotheques. Quaint Spanish-style homes, churches, cobblestone streets and beautiful fountains are situated between surrounding volcanoes. The city consists of approximately 30,000 inhabitants. It is the capital of the state of Sacatepéquez, and can be easily reached from Guatemala City. In colonial times, following the Spanish conquest of Guatemala in the early 1500s by Don Pedro de Alvarado, the town served as the Spanish capital of Central America. 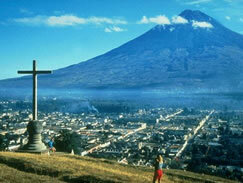 In 1773 Antigua was partly destroyed by an earthquake and the present capital was established in Guatemala City. 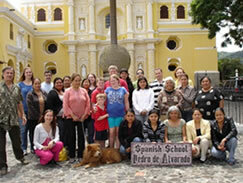 The climate of Antigua is generally warm and pleasant, andaverages about 70ºF. Cool breezes prevail and the city is never uncomfortable. In September, brief showers normally occur, but only during a portion of the afternoon. As an indication of its excellent climate, Antigua is known as the City of Eternal Spring.